In French, it is known as the Gray-mantled Gull, Goéland à manteau ardoisé. 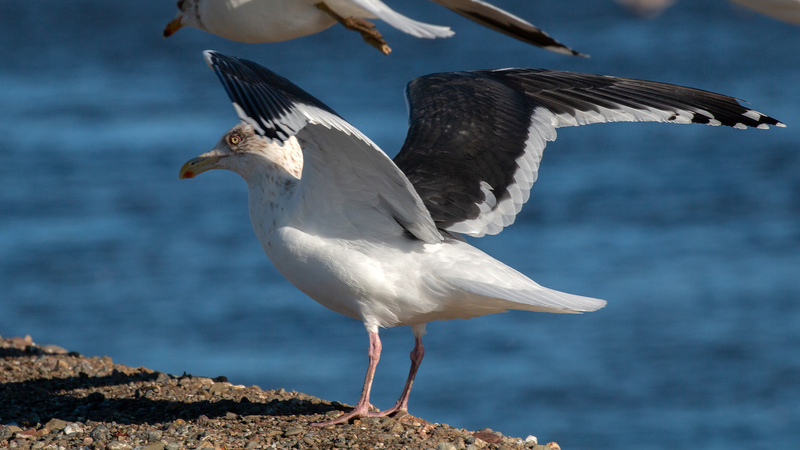 In Spanish, it is the Kamchatka Gull, Gaviota de Kamchatka. 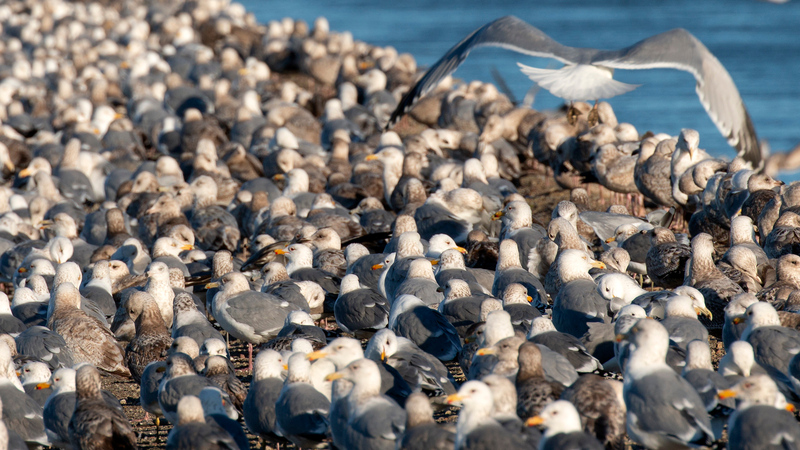 In English, we call it the Slaty-backed Gull. For those of us living in California’s San Joaquin Valley, we call it the “Extremely Rare Gull”. So rare in fact, that it has only ever been seen once before in the entire San Joaquin Valley, and never in Stanislaus County. 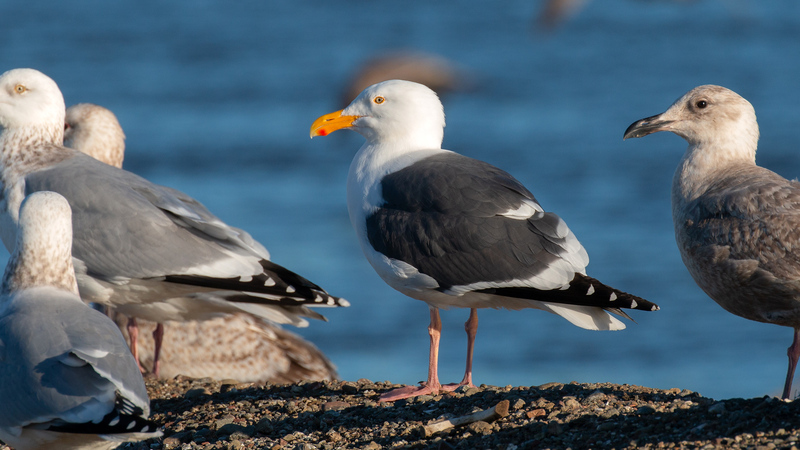 The Slaty-backed Gull is a regular breeding bird along the coastal areas of the Western Pacific from North Korea, Russia (including the Kamchatka Peninsula) and just a tiny portion of the Seward Peninsula in north Alaska. It spends the winter mostly in the coastal areas of Japan, Korea and the Yellow Sea area of China and can show up unexpectedly in random locations in the US, from California to Texas. As of February 18th of this year, it can now be counted as a visitor to Stanislaus County. 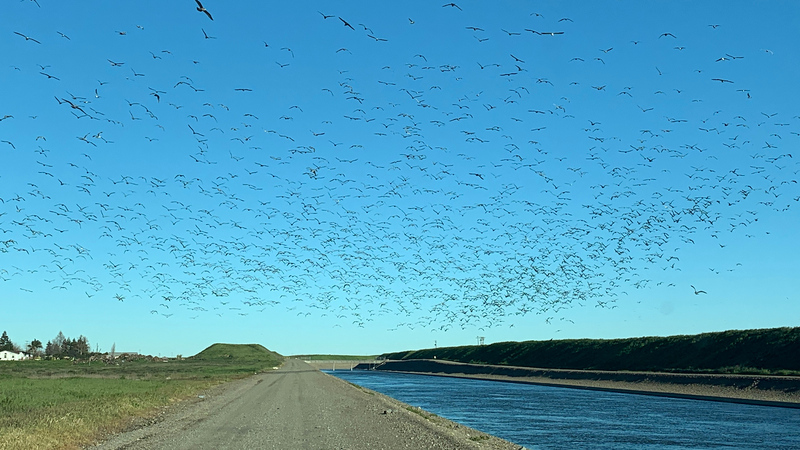 If it were a FaceBook-using gull, on February 18th of this past week, it could have done a Check In from the Recology Grover Environmental Products facility north of the Westley Rest Area. Or more precisely, hanging out with 6,000 of its Facebook friends along the California Aqueduct next to the Recology Facility. 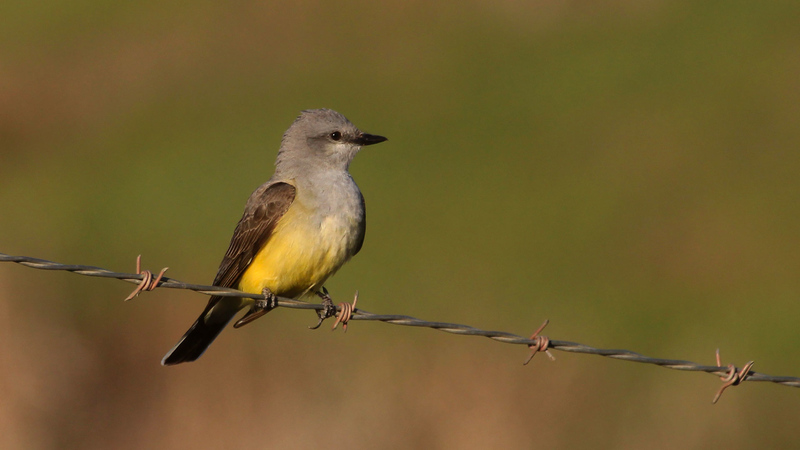 According to the records from the California Bird Records Committee data base, the first ever accepted record for the state dates back to February 5, 1995 with the second ever record coming six years later in 2001. Over the past decade there have been a total of 36 accepted sightings. 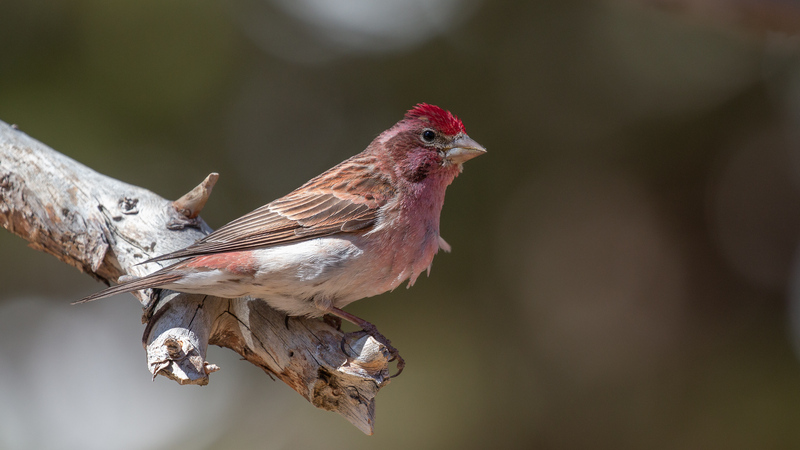 The increase in records could be due to an actual rise in the numbers of birds straying over here from Asia, or it could be that birders are more informed and knowledgeable on the identification of the bird. I suspect that it is a combination of both factors. 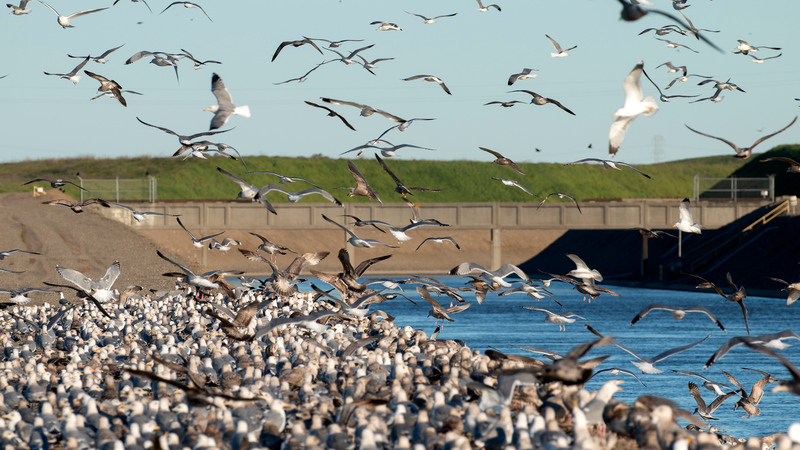 In February of last year, David Yee (aka birdmanyee) spotted and carefully recorded the first Slaty-backed Gull for the entire San Joaquin Valley, from Bakersfield to the Delta. 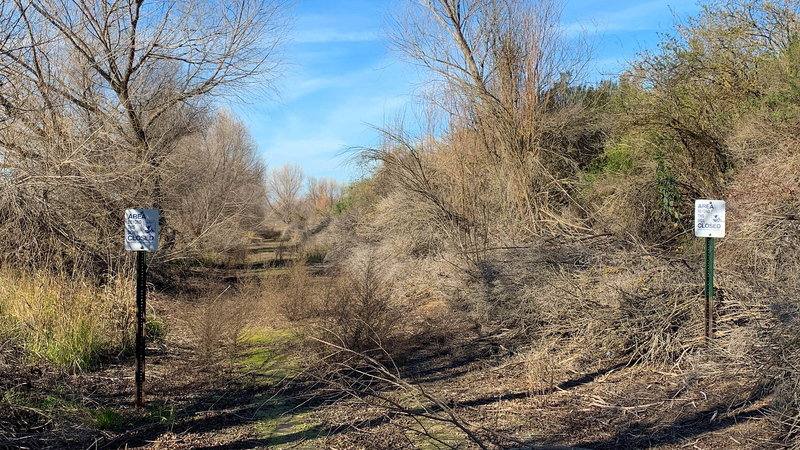 The bird he recorded was found at the gravel pits along Koster Rd, San Joaquin County, barely a mile north of the Recology Facility on Gaffery Rd, Stanislaus County. 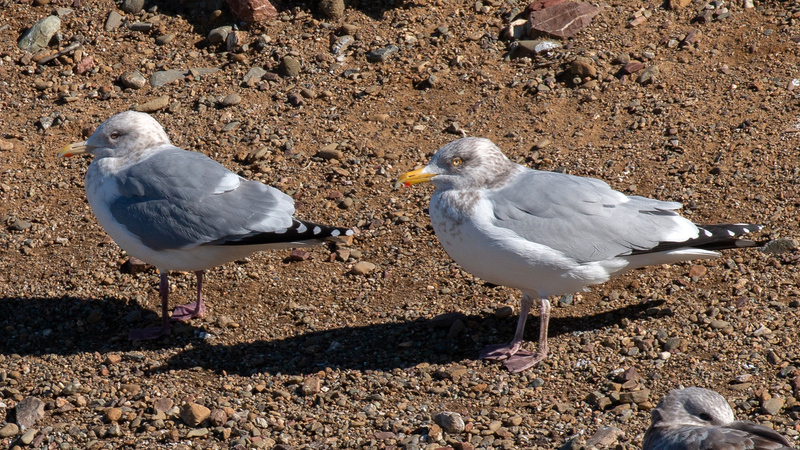 So, how hard is it to find and identify correctly, a Slaty-backed Gull? 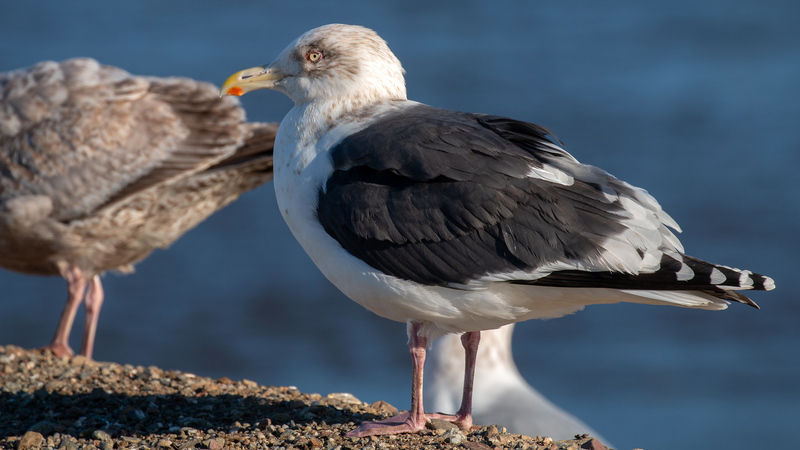 For reference, the same CBRC database of Slaty-backed Gull records over the past decade, also shows that 40% of submitted sightings were not accepted due to the difficulty of identification. 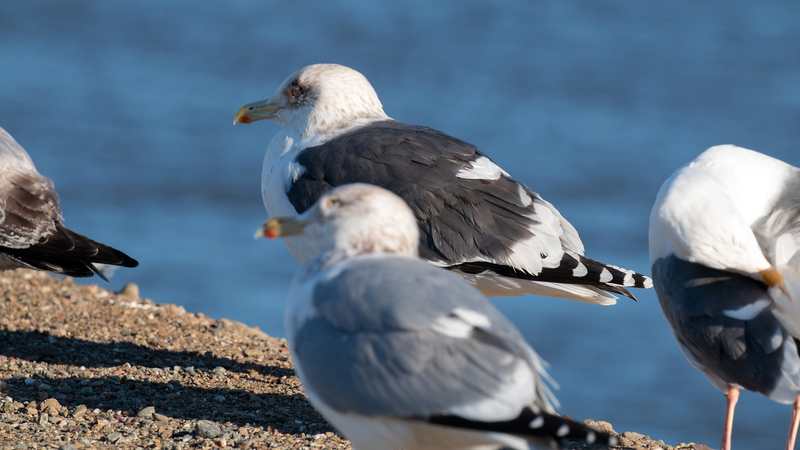 There have been 16 different species of gulls documented in Stanislaus County, 8 of which are in the same bird family, Larus. 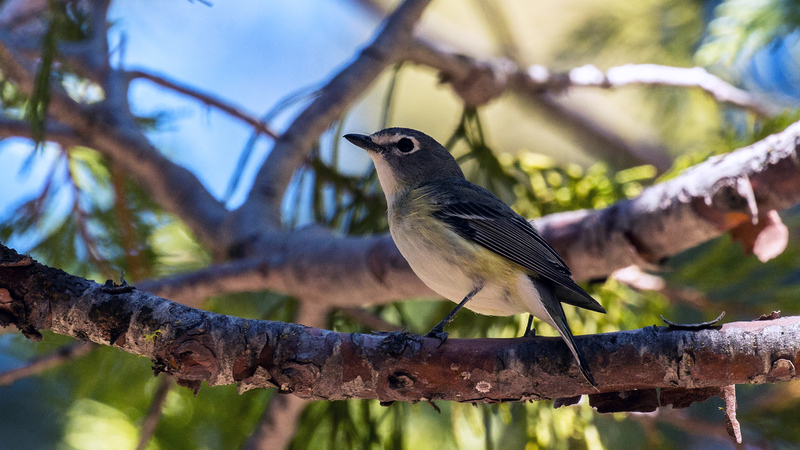 Of these 8 similar shaped and sized species, for adult birds, identification can be narrowed down by a quick look at feet and back color. 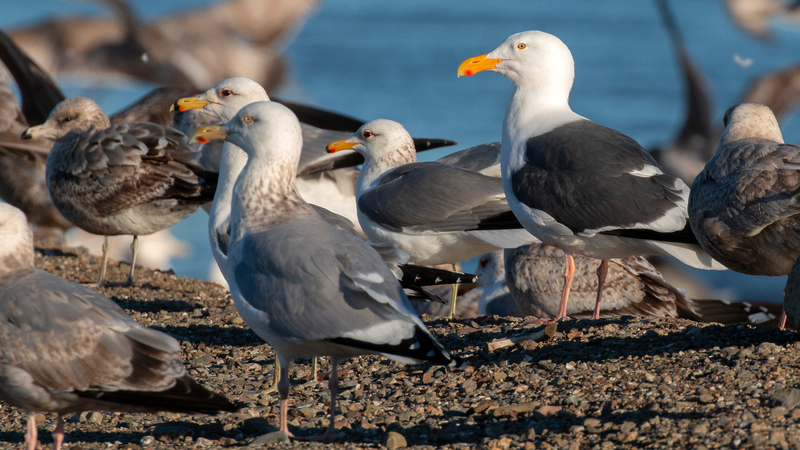 Adult Larus gulls have a mostly solid mantle ranging from medium gray to dark gray to black. In the photo below the ranges are pretty visible from the medium gray-backed gulls in the middle to the black-backed gull on the upper right corner. 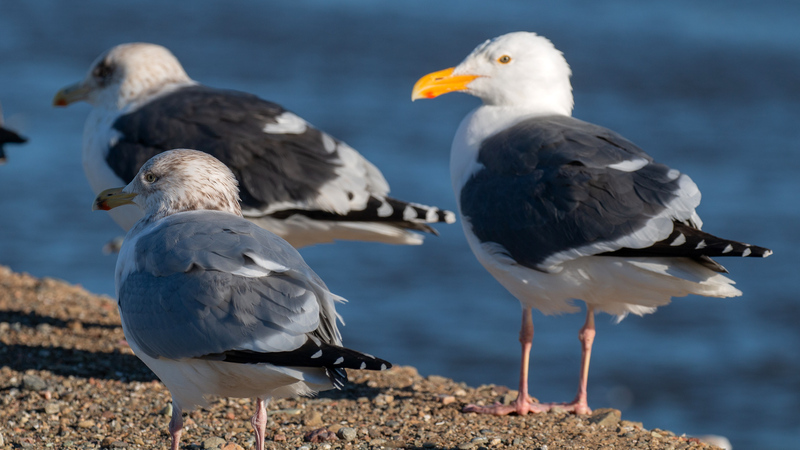 In the case of the Slaty-backed Gull in this post, we are looking for one like that black-backed gull. So as I scan the flock, I have a search cue set for birds with an obvious black back. The challenge is that the flock is in constant motion. Birds come and go and on occasion, the entire flock will burst upwards in unison, circle around and land back on the canal bank or gentle land and float in the water, completely mixing up which birds I had already scanned and which ones I hadn’t. I made one pass though the entire flock, taking about 45 minutes to do so. I turned around and started back. During my first pass, I noted at least 8 to 10 Western Gulls, which have the black(ish) back. They are actually somewhat rare in the county, but can be found here if the gull flock is large enough. I made my way slowly back down the canal, gently causing the birds to mostly just peel off a couple at a time and then fly behind the car and land. Most of them just walked out of the way. I was going very slowly and they practically ignored me. I was almost completely through the end of the flock again when I noticed a 1st year Glaucous Gull on the other side of the canal. That is another rare species, about as uncommon as the Western Gulls, but not an extreme rarity. I frequently glanced in my side-view mirror to make sure another vehicle wasn’t coming so I could focus on the gull across the canal. 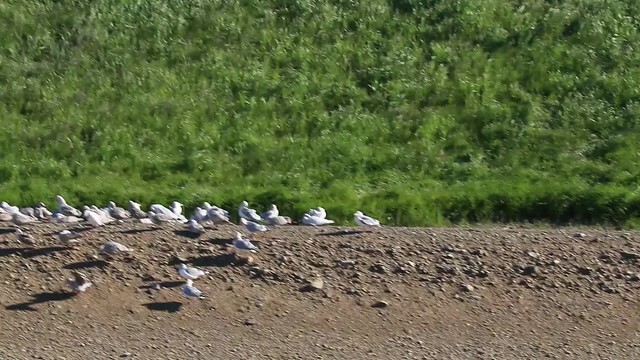 I noticed there were two “black-backed” gulls on the berm behind me. 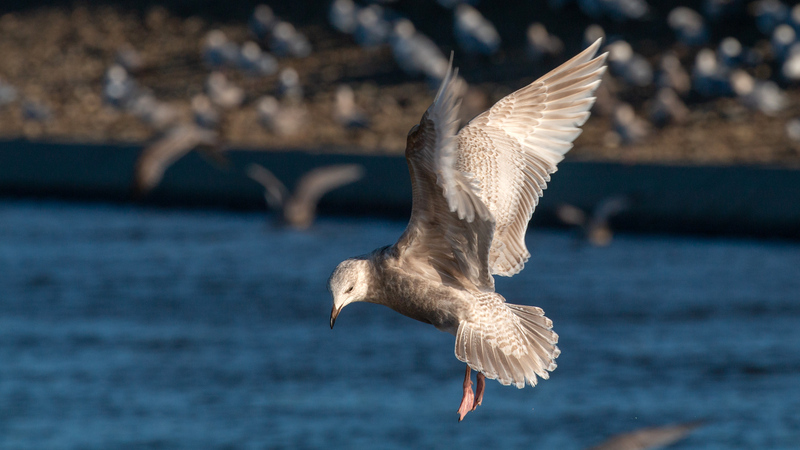 I thought to myself, “after I get shots of this Glaucous Gull, I can shoot the two Westerns behind me”. 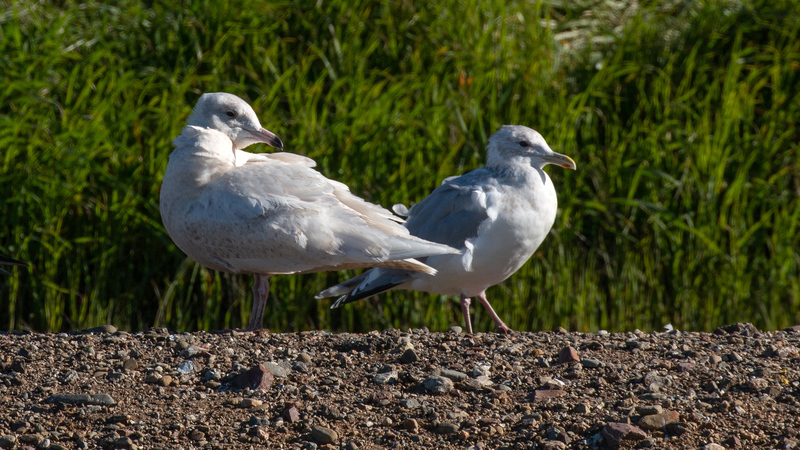 As a photographer, you can never get too many shots of a rare gull, so after shooting 2 dozen shots of the Glaucous Gull across the canal, I got out of my car slowly, so I could get some shots of the two Western Gulls. I zoomed in and took a shot of the closest Western that was right next to a common Herring Gull, with the other “Western” gull behind them both. 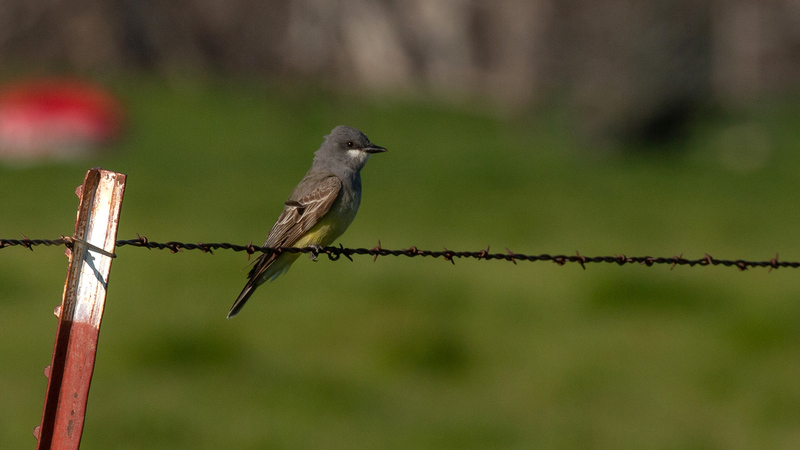 As I focused on the front Western, I took a couple of shots and then decided to try and get all three birds in focus. It was the next focus in my viewfinder that knocked my socks off! 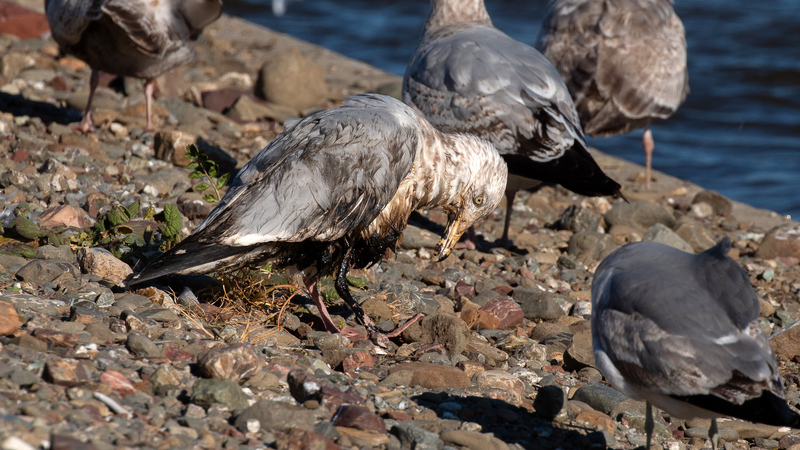 The second “Western” gull was clearly NOT a Western Gull, it was THE Slaty-backed Gull. Suddenly, I couldn’t hold my camera straight, my hands started to shake and my heart beat went off the charts. But I knew that I had to get about a million shots of this bird AND I has to get it in flight. The absolute positive ID of this bird is cemented by the documentation of a series of white pearl spots along the primary flight feathers. The pattern visible on the extended wing shows a terminal white spot, a black spot and a second white spot above the black one. 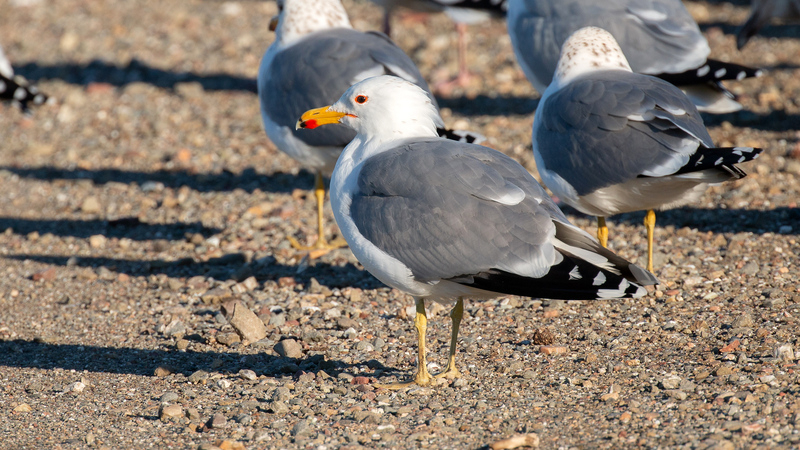 These spots are not present on the similar looking Western Gulls. 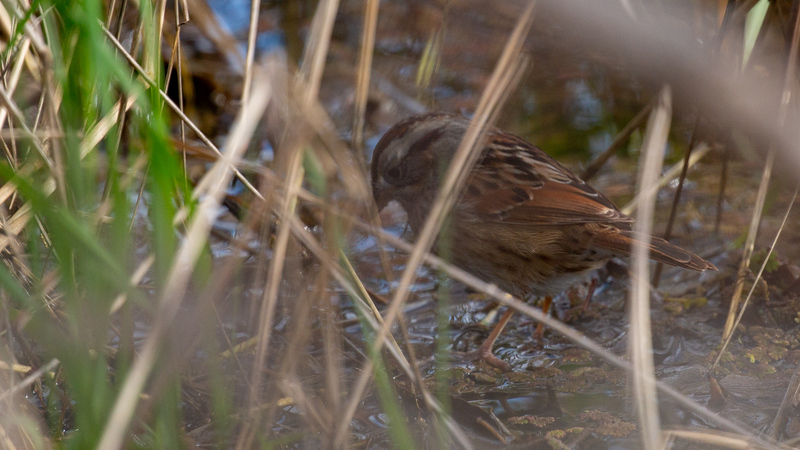 Pretty soon, I calmed down because the bird simply could not be bothered by my presence. I slowly started walking towards it, click, click, clicking as I went. Not wanting to scare the poor thing, I just stood there clicking more shots. I even went to video mode and shot about 4 minutes of it just standing there doing nothing. 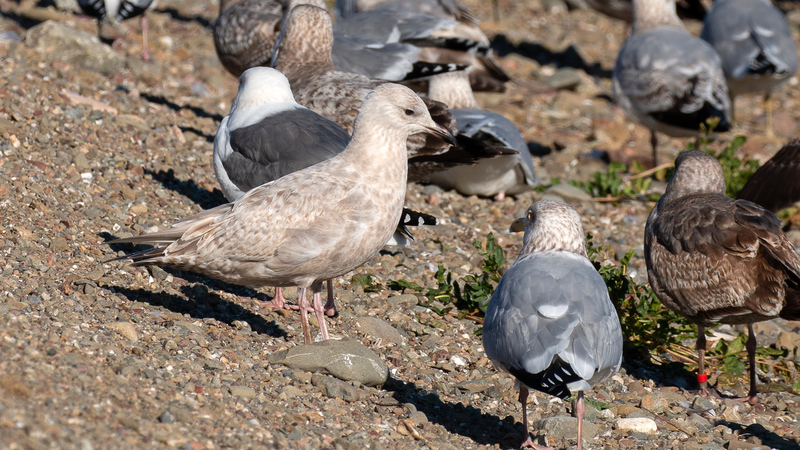 At one point, part of the flock flew up and moved back about 40 feet, but the Slaty-backed just stood there. At this point, the gull was a mere 13 feet away and just watching me. 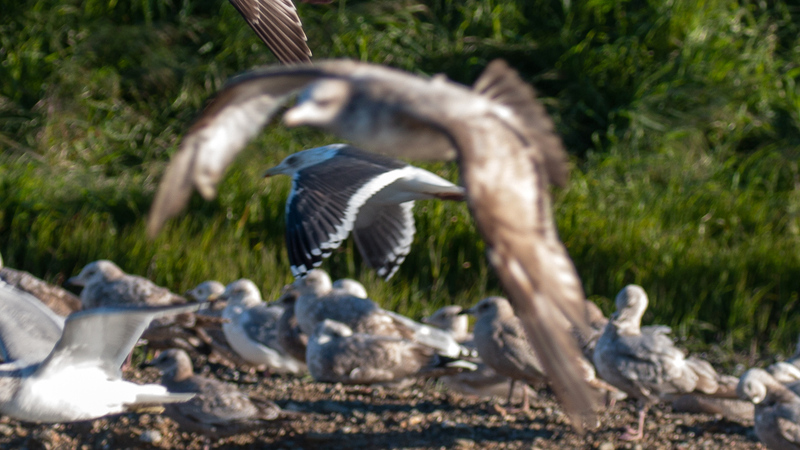 Suddenly once again, the gull flock took off, and this time the Slaty-backed Gull went with them. I tried to keep up with it amongst the swirling cloud of gulls, but most shots were either blurred or partially blocked by other gulls. 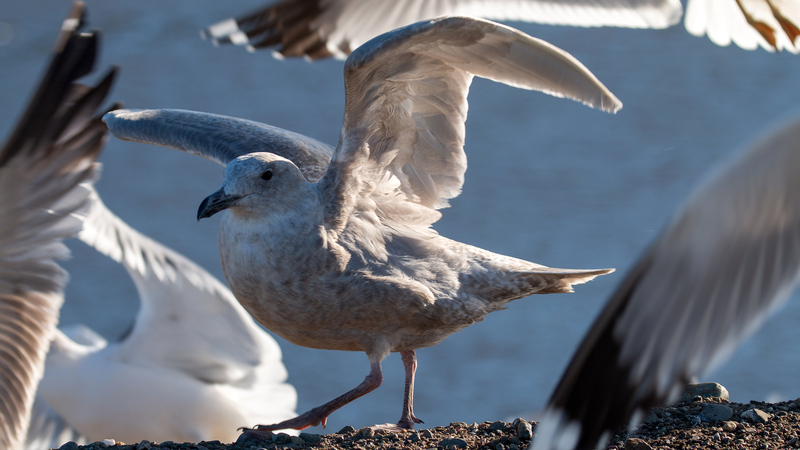 After I had calmed down and was certain I had some decent photos, I reached out to David Yee to see if this gull had the same appearance as the one he had the day before. I sent two snapshots from my camera’s viewfinder via email and he promptly responded that it looked like it might be the same bird. I then texted a few local birders and sent Eric Caine an email with the information. He responded that he was running out the door and would get there as soon as possible. Notifications were then also sent to the local bird groups. Unfortunately, by the time Eric got out to me at the canal, THE gull was awol. Birders as a whole, can be quite passionate about their bird lists. 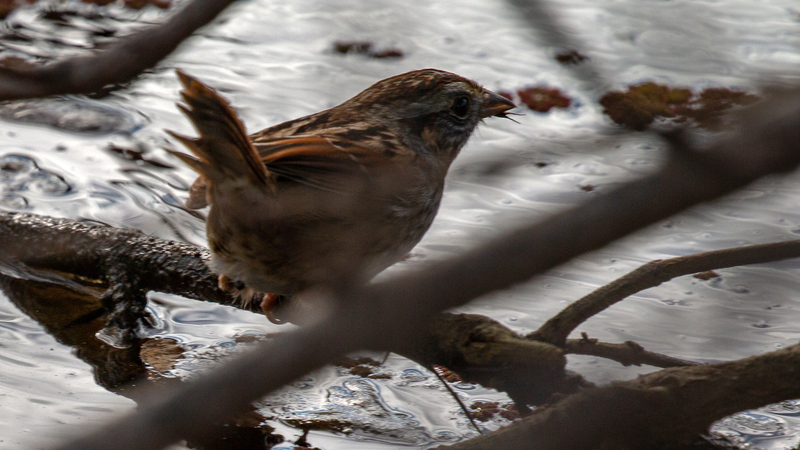 While we still thoroughly enjoy the activities of our common sparrows and finches, it’s the rare birds that really fuel our obsession. We live for that next new addition to our beloved list. The subtleties and nuances that separate a rare species from the more common ones, can provoke a splendid detective case where every detail becomes a critical piece of evidence. As the case for a rare bird is built, the facts can sometimes be obfuscated by what we want to see. Sometimes the facts may be not be as relevant and we suspect them to be. This is especially true when photographic records are obtained second-hand. And so it began, a text with 4 short words. A text that would result in 3 1/2 hours of field work, and a few more hours of research and detective work behind the computer. 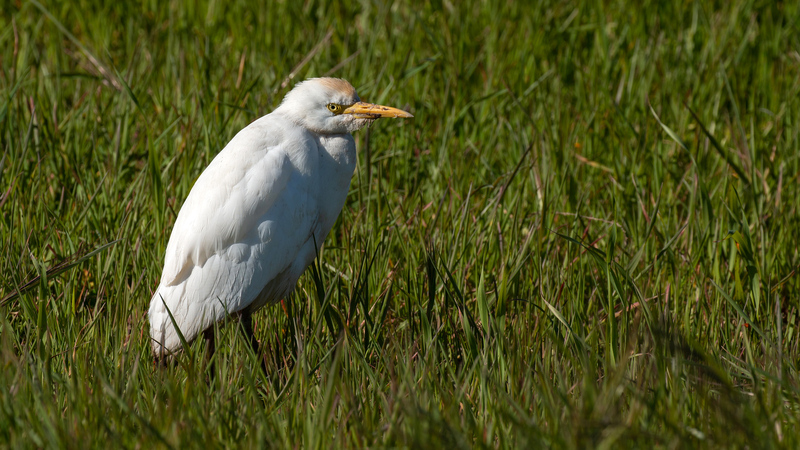 Some birders, new to the obsession, had noticed an unusual bird mixed in with the usual suspects out at the San Joaquin River National Wildlife Refuge, west of Modesto. The bird in question superficially looked similar to a regular winter resident of any wet habitat, the Greater Yellowlegs. But this bird just didn’t look like the others nearby. It didn’t have the long, pointy-tail look, the legs were a bit off-color (peachy) and the base of the bill seemed pale. They knew enough to try and get some good photos of it and then to send them to someone that had more experience. And so, the novice birders sent their evidence to a veteran valley birder. As in a court case, the images were now second-hand evidence, as the veteran birder had not actually seen the bird. 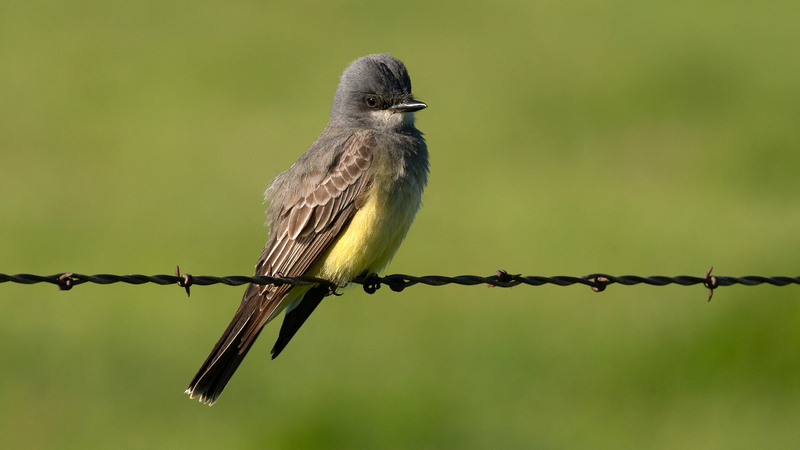 While images of a bird can be quite helpful, there are some caveats to this value. 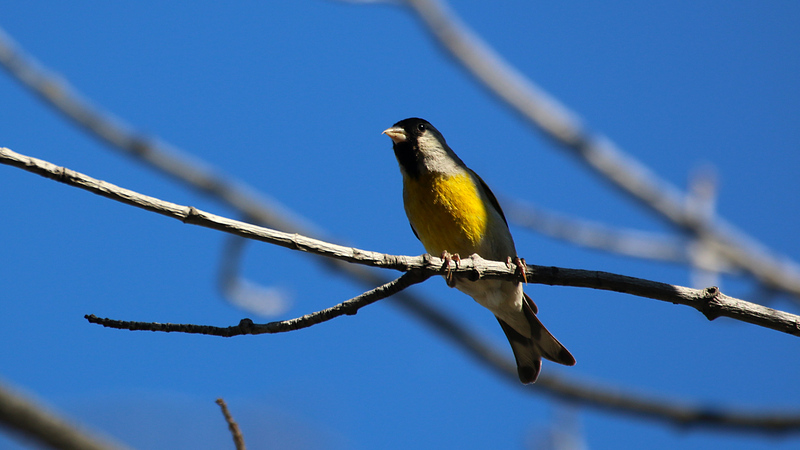 Distant birds, combined with low quality lens’s or digital zooming can distort size and color. As can the position of the sun relative to the photographer and the subject. 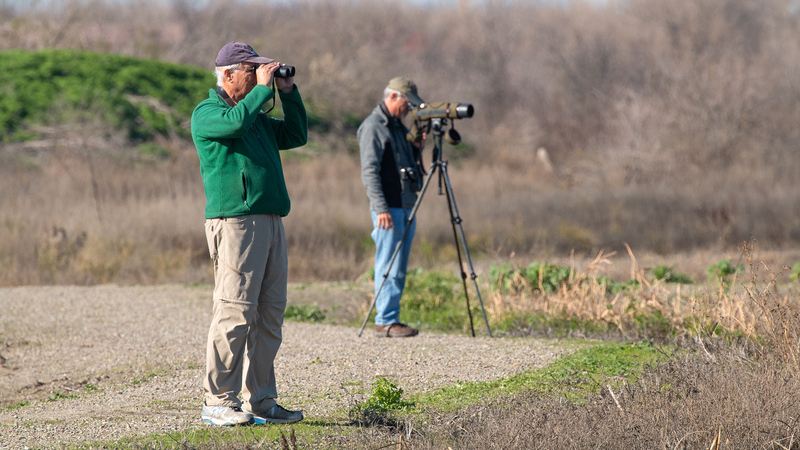 The experienced birder knows the importance of when to broadcast a rare-bird sighting and when not to. Birders have been known to immediately book flights to chase down the rarest of sightings and the miss-reporting of a rare species can deal a blow to the reporter’s reputation (not to mention the waste of money…). In this case, the evidence seemed sufficient to warrant a limited broadcast to some of the locals in hopes they might gather more evidence to support a potential rare bird. With only the location known and two poor images, I raced out the door, yelling to my wife, “be back later…” In route to the refuge I got a phone call from Salvatore Salerno explaining a little more about “the bird.” First a little background about the usual “Tringa” sandpipers vs the rare ones. 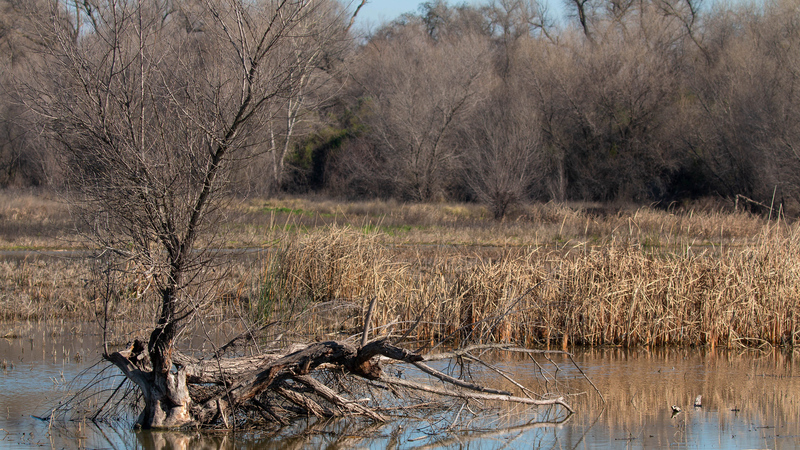 Greater Yellowlegs belong to the Genus Tringa and are common throughout the valley in any wetlands, ponds, lake shore or flooded field from August through May. Less common is the Lesser Yellowlegs which is more of an uncommon spring and fall migrant, with a few individuals sticking around in winter. The rarest of Tringa shorebirds include the Spotted Redshank, Marsh Sandpiper and Wood Sandpiper, and it was the possibility of the mystery bird being one of the latter that got us all motivated. 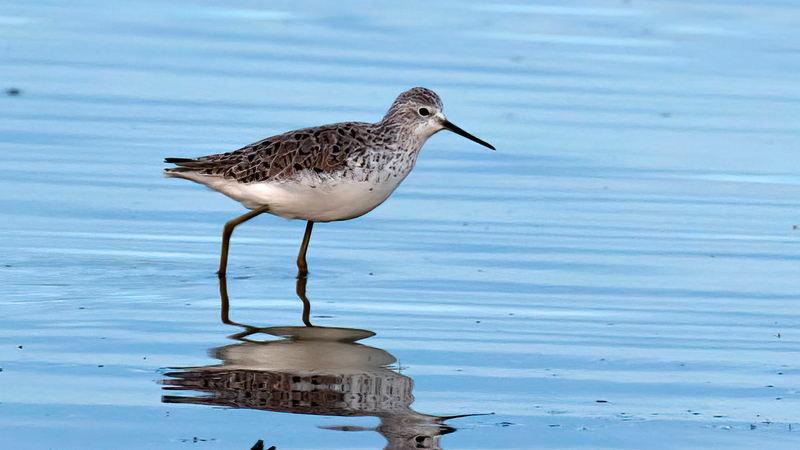 – Wood Sandpiper (3 CA records) with none in the Central Valley. 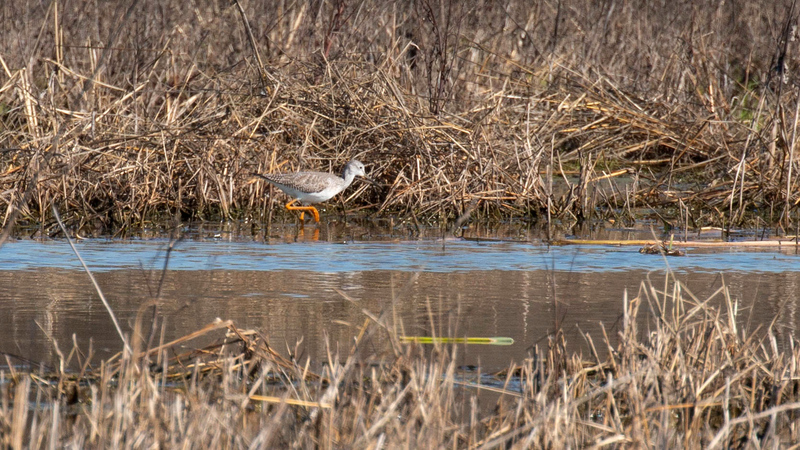 There were three pieces of evidence from the photos that seemed to point to the possibility of a Spotted Redshank; short-primary projection, light-base of the bill and peach-colored legs. Fortunately, the weather was beautiful and it was a short walk from the parking lot to where the bird was seen. As a photographer, I have many “Squirrel” moments and am readily distracted by any bird that will pose long enough for me to snap a few shots. Today was no different and as I walked to the flooded field, I couldn’t help but stop and shoot a couple dozen images of the Sandhill Cranes as they were constantly flying around the area. I made a mistake when I ran out the door to get here as quickly as possible, and I failed to grab my telescope. I knew instantly that this was going to be a tough stake-out. There were dozens of Greater Yellowlegs as well as one or two Lesser Yellowlegs. And they were all a bit too far out to get good photos of. 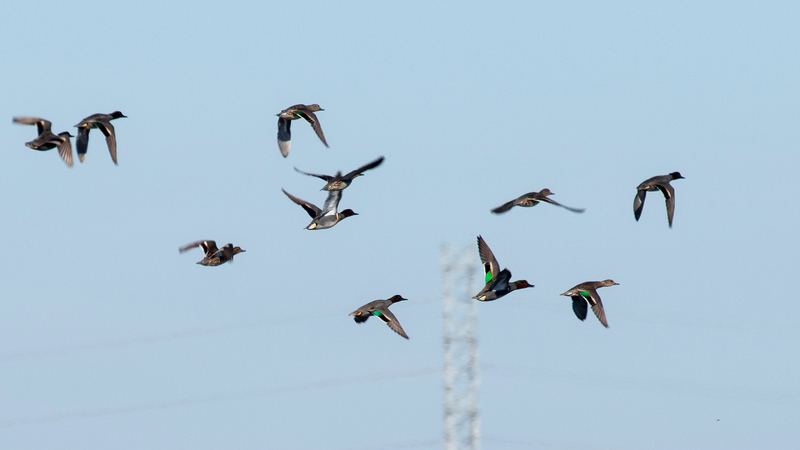 I scared up a flock of Green-winged Teal as I walked around the pond. A short time later, Sal appeared (no telescope either) along with Daniel Gilman who fortunately did have one. As were continuously looked at first one yellowlegs, and then another, and another, we delved into a discussion about the possible rarities, and what we needed to observe to make a solid case of identification. Using the Sibley iPhone App, we looked at images and listened to each suspect’s call. We never saw anything that resembled what we thought could be a rarity and after a bit, Sal and Daniel departed. I decided to take advantage of the gorgeous weather and I walked as far as I could along the nature trail. I was serenaded by California Towhees, California Thrashers and Wrentits. I couldn’t go very far down the trail as the refuge staff had posted closed signs a short ways down the trail. I’m not sure if this is permanent or a by-product of the government shut-down. 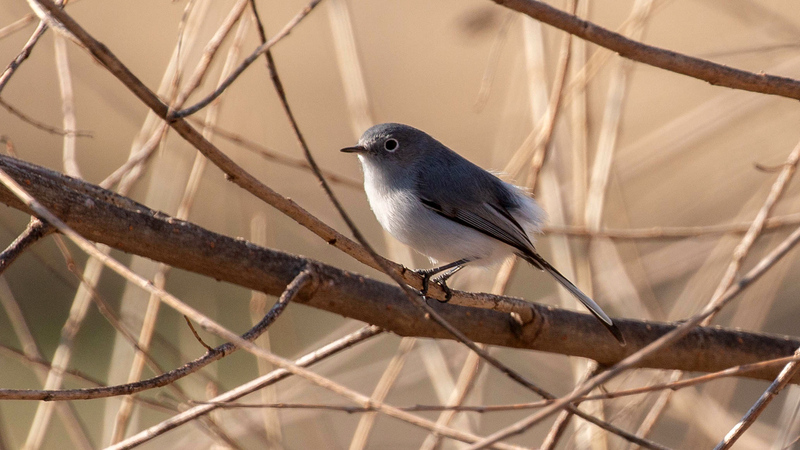 On the way back to the parking lot I had a Blue-gray Gnatcatcher make its buzzy call right next to me and I got a decent shot of it. On the ride back into town, I got a call from Sal commenting that more in-depth analysis of the photos revealed that the mysterious “Might-be-a-rare-bird”, was after all, not quite so rare. It was deemed to be a first winter Lesser Yellowlegs. A winter sighting of a Lesser Yellowlegs was definitely uncommon, but not something to be added to the great list of rarities. 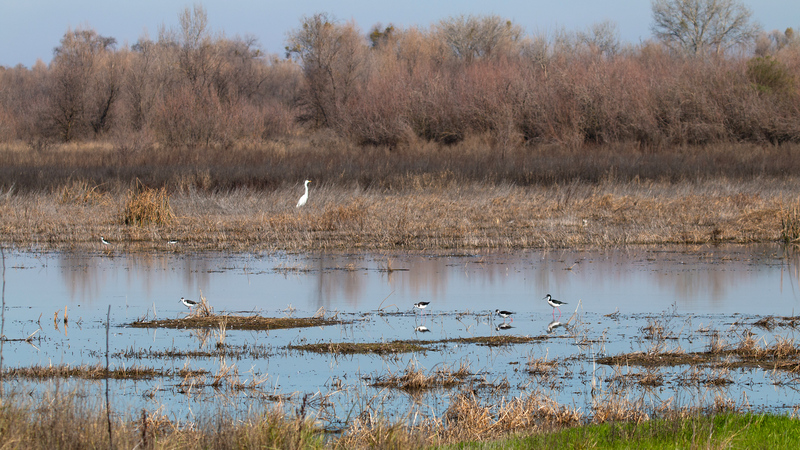 While I didn’t get to add a new rare bird to my list, I had a very enjoyable walk in nature, got a few photos and learned a lot about the rare Tringa shorebirds of California. 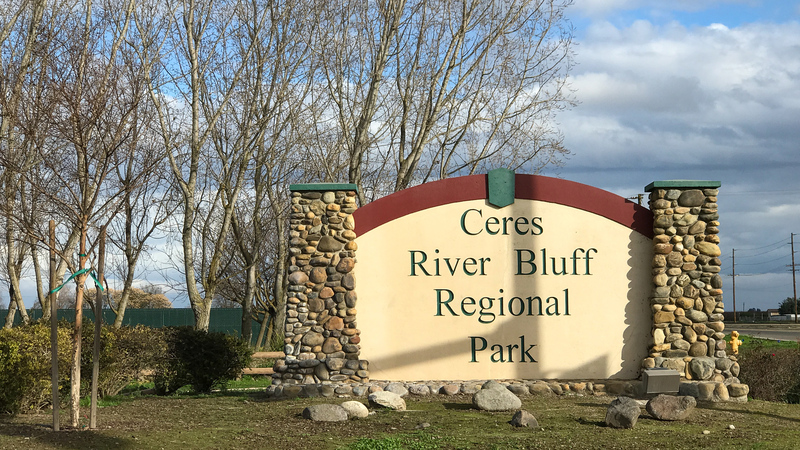 Map to the Ceres River Bluff Regional Park. 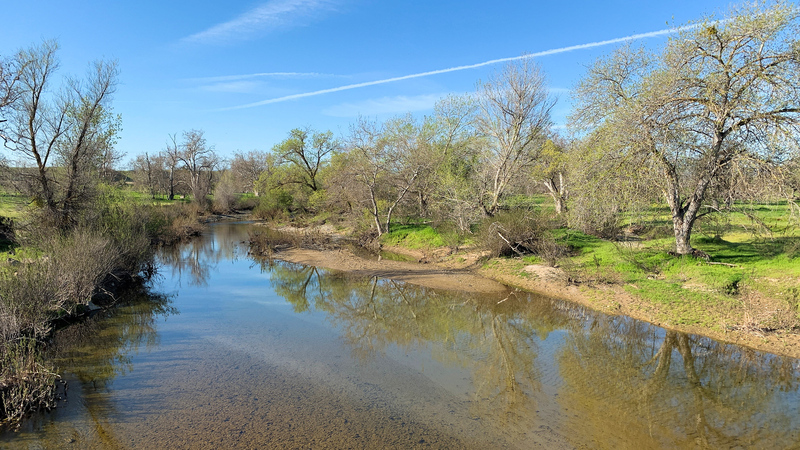 I pull in to the Ceres River Bluff Regional Park on Hatch Road, Ceres expecting to be able to drive down to the usual parking spot at the bottom of the bluff. 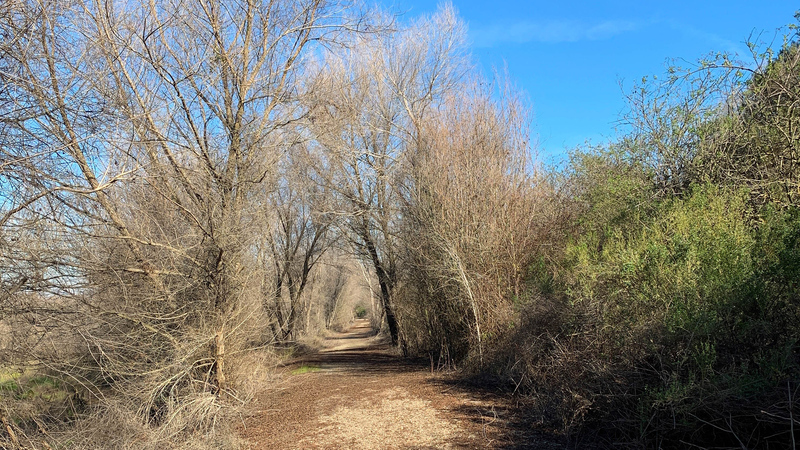 This park got a lot of attention by birders lately when Harold Reeve discovered Stanislaus County’s first ever record of a Black-throated Sparrow here, as well as hosting a Chipping Sparrow which can be hard to find on the valley floor. This time though the drive down to the lower parking area was closed, and as I parked, I noticed Ralph Baker’s car right next to me. I eventually caught up to him and Kathy Rasmussen and they were standing with Harold and Sherrie Reeve. They had been watching the bird off and on for a while and pointed out to us the different spots they had seen it at. After about twenty minutes of fruitless searching, they decided to head out and the three of us remained, quietly listening, watching, listening and watching in vain for another hour. The pond area is quite scenic with reeds, willows and oak trees. 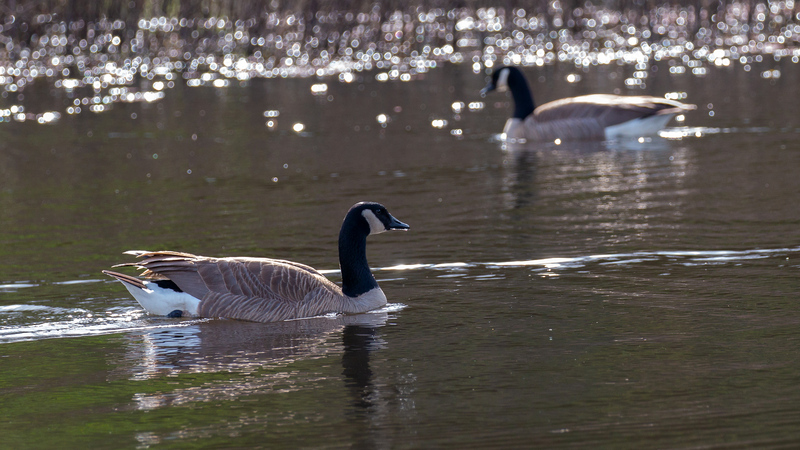 As we waited I photographed some of the Canada Geese that were swimming around us. Eventually I commented that I would need to leave in 20 minutes. They jokingly replied, “Well, then we will leave in 25 because it will pop up right after you leave!! !” I played a few calls off my Sibley’s Bird app. 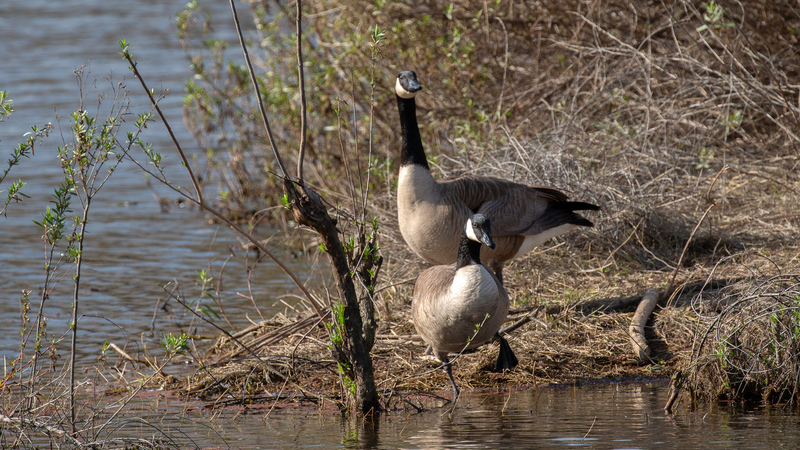 Not realizing that I had stopped the audio, Ralph asks, “Are you still playing the calls because I can still hear it calling…” I wasn’t sure if what we were hearing was a muffled Common Yellowthroat, Yellow-rumped Warbler or our target bird. I walked out to the point and played the calls again. Ralph yelled out that a sparrow flew right over to where I was playing the call. 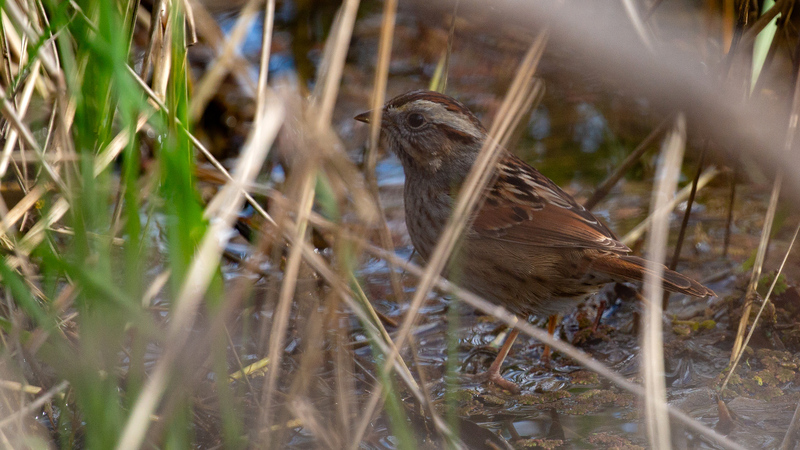 Swamp Sparrows belong to the Genus Melospiza which include the more locally common Lincoln’s Sparrow and Song Sparrow and can be a challenge to correctly identify. 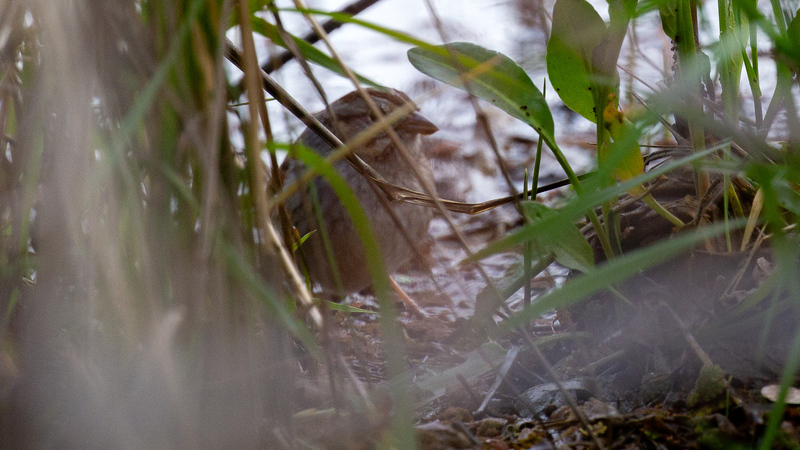 They are notorious for keeping in the shadows and “skulking” behind the vegetation. 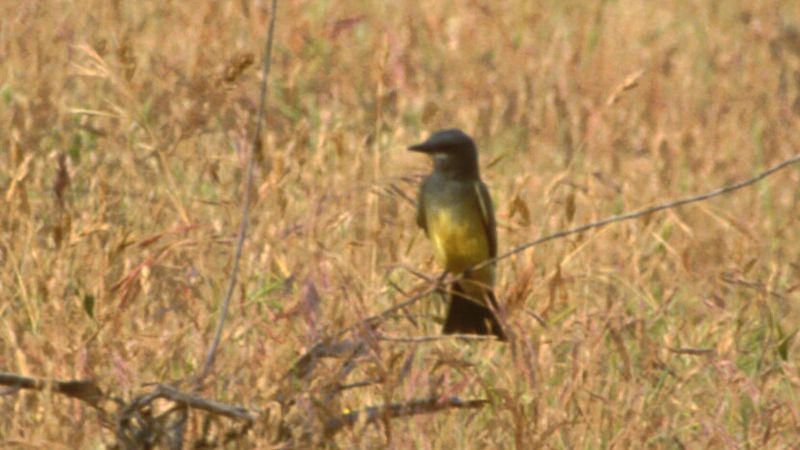 Sure enough, the bird gradually walks out from the weeds, towards the back of a bunch of vegetation. I yelled at Ralph and Kathy and started trying to focus through the vegetation on the bird in the shadows. The angle was bad and the lighting poor, but I managed to get a couple of decent shots of the bird. 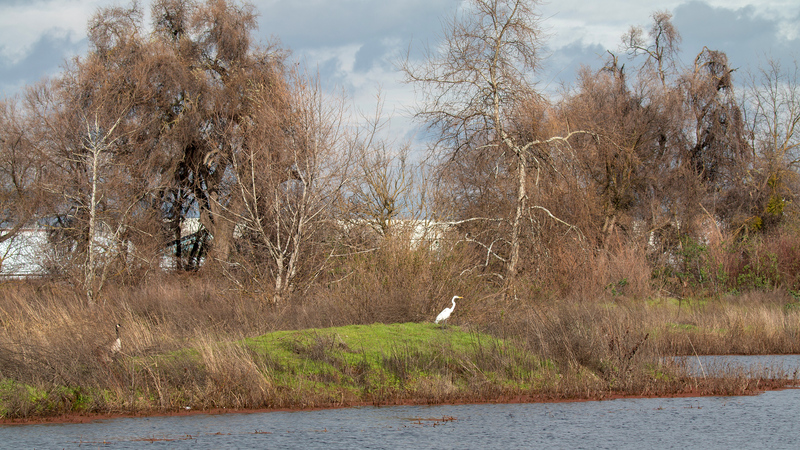 It was a LIFER for Kathy and a Stanislaus County bird for Ralph. 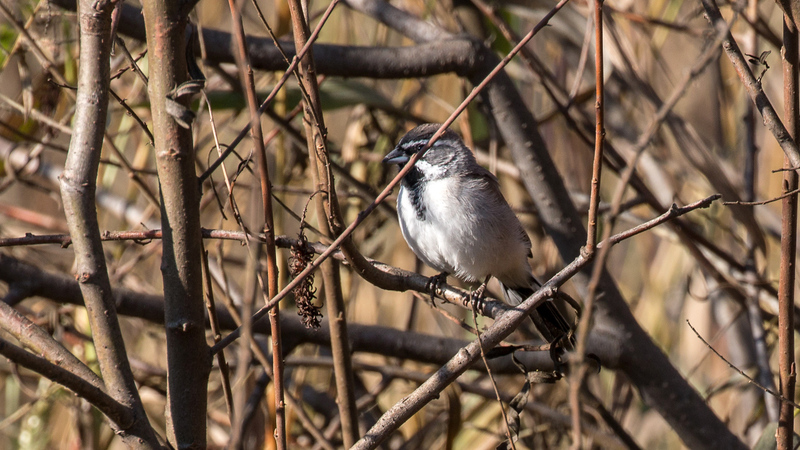 According to the Cornell Lab of Ornithology, a winter, non-breeding (what birders refer to as basic-plumaged) adult has a white throat with a gray-washed breast and extensive reddish-brown in the wings (primary coverts). 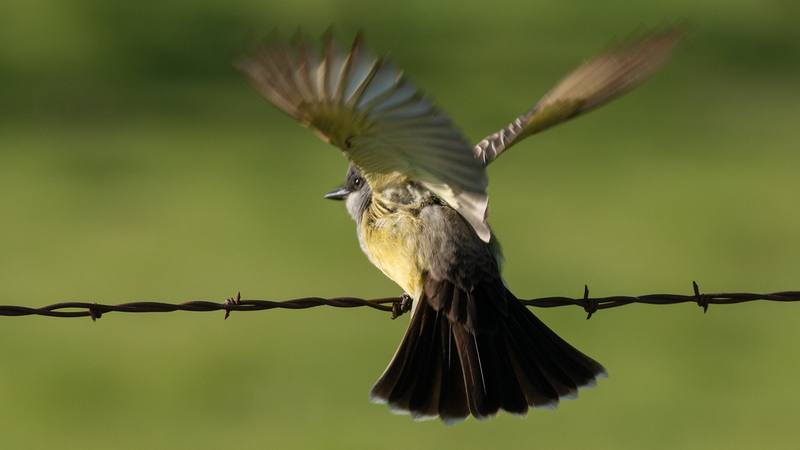 Here is an example of just such a bird from their website.